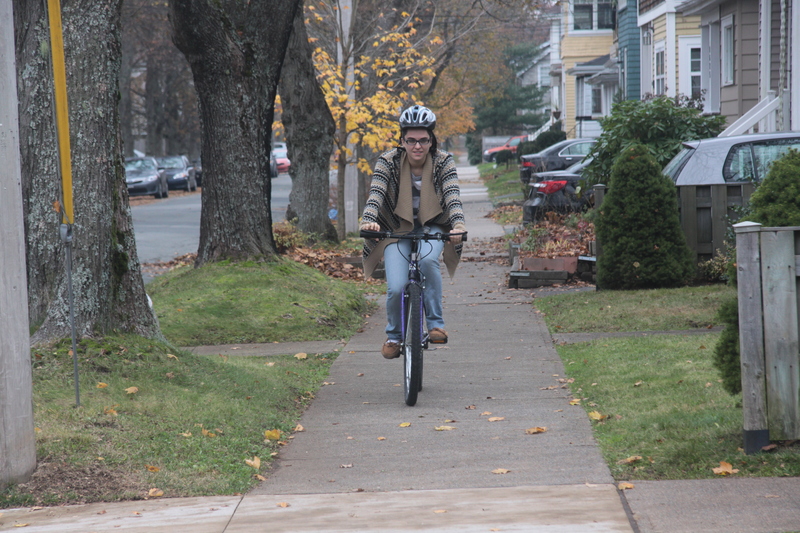 Big changes may be coming to Dalhousie’s bike-friendly infrastructure, but not as fast as students might like to see them. The Dal Student Union (DSU) is moving forward with its plans to renovate the Student Union Building (SUB), but long-standing promises by the university to update cycle paths on campus are still far from coming to fruition. At the last public consultation hosted by the student union on Oct. 28, Keith Tufts of Lydon Lynch architects, the firm tackling the SUB renovation project, confirmed that he was not planning to integrate the Dalhousie Campus Master Plan’s vision for a pedestrian and active transport lane in front of the SUB on University Avenue. While his plans for the new SUB include designated spaces for desperately needed bicycle parking, implementing a bike lane is out of his hands. He says it’s because the SUB renovation doesn’t plan to go out to the sidewalk, but he also added that Dal has yet to make any progress on their own bike-lane project. In 2010, the university published the Campus Master Plan, a 46-page document outlining the administration’s ideas and proposals for how to manage the physical space around campus. According to the facilities management website, so far completed projects from the plan include the Dalhousie Ocean Sciences building (budgeted at $41.5 million), the Mona Campbell building ($30 million), the Life Sciences Research Institute ($65 million), and campus lighting upgrades ($4.6 million). But quality of student life-oriented projects like the Active Transportation Roadway, a proposed blocking-off of the southern half of University Avenue for use by cyclists, pedestrians, and other active transit users only, is nowhere to be found. According to Nathan Rogers, the assistant director of capital planning at Dalhousie facilities management, that’s because it’s still the city that owns the land between the sidewalk in front of the SUB and the patch of grass separating University Ave’s north and south lanes. He says that while he’s confident the plan will go ahead, much of it is still up in the air. He also confirmed here have been preliminary meetings with HRM to make it happen, and though negotiations with them on the topic are ongoing, the municipality appears to be amenable to the idea.